Although we prefer to measure every customer ourselves, we understand that not everyone can come into our shop for a measurement. So, to provide us with an accurate measure for your size, please follow these simple instructions below. Although it is possible to get a good measurement by yourself, we recommend that you have someone assist you. NOTE: For best results, please use a cloth measuring tape like the kind used by tailors or seamstresses. If this is not available, a ribbon or other material that does not stretch will do. Place the tape around the fullest part of the back of your head, bringing the tape around on both sides, about one half inch above each ear. Continue wrapping the tape around the head to meet on the forehead, about one half inch above the eyebrows. If you are using a tape with centimeters, you may use the size menu below to choose the appropriate size for the circumference of the head. If you have any questions, please contact us by phone or email, we want your hat to fit as perfect as possible. Using the shapes shown below as your guide, please choose the shape that best represents the top of your head. If you prefer to have us verify your head shape, please email us a photo of the top of your head and a facial photo, just to be sure. Again, if you have any difficulty with measuring, ordering or just questions about the styles or qualities of felt or straw, please don’t hesitate to contact us. 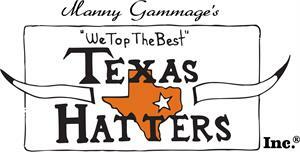 Manny Gammage’s Texas Hatters, Inc.